Malaysia is a multicultural society, with Malays, Chinese and Indians living side by side. The Malays are the largest community. They are mostly Muslims, but there are Christians and Hindus amongst them. The Malays speak Bahasa and are largely responsible for the political fortunes of the country. The Chinese comprise about a third of the population. They are Buddhists and Taoists, speak Hokkeen, Hakka and Cantonese, and are dominant in the business community. The Indians account for about 10% of the population. They are mainly Hindu Tamils from southern India, they speak Tamil, Malayalam, and some Hindi, and live mainly in the larger towns on the west coast of the peninsula. There is also a sizeable Sikh community. Eurasians and indigenous tribes make up the remaining population. Despite Bahasa Malaysia being the official language, when members of these different communities talk to each other, they generally speak English, which was recently reinstated as the language of instruction in higher education. The Malays Today, the Malays, Malaysia's largest ethnic group, make up more than 50% of the population. In Malaysia, the term Malay refers to a person who practices Islam and Malay traditions, speaks the Malay language and whose ancestors are Malays. 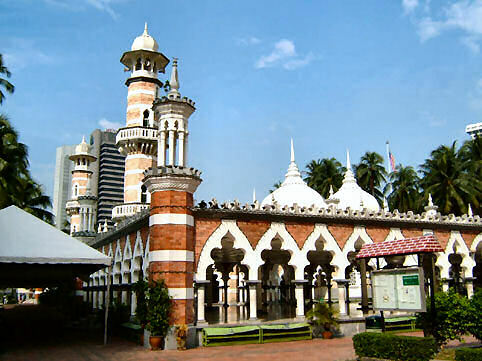 Their conversion to Islam from Hinduism and Theravada Buddhism began in the 1400s, largely influenced by the decision of the royal court of Melaka. The Malays are known for their gentle mannerisms and rich arts heritage. The Chinese The second largest ethnic group, the Malaysian Chinese form about 25% of the population. Mostly descendants of Chinese immigrants during the 19th century, the Chinese are known for their diligence and keen business sense. The three sub-groups who speak a different dialect of the Chinese language are the Hokkien who live predominantly on the northern island of Penang; the Cantonese who live predominantly in the capital city Kuala Lumpur; and the Mandarin-speaking group who live predominantly in the southern state of Johor. The Indian The smallest of three main ethnic groups, the Malaysian Indians form about 10% of the population. Most are descendants of Tamil-speaking South Indian immigrants who came to the country during the British colonial rule. Lured by the prospect of breaking out of the Indian caste system, they came to Malaysia to build a better life. Predominantly Hindus, they brought with them their colourful culture such as ornate temples, spicy cuisine and exquisite sarees. The different types of religion in Malaysia reflects the variety of races living there. Islam is the official religion but Buddhism, Hinduism, Christianity and other religions are practiced freely. Islam is practiced predominantly by the Malays. Most of the Chinese believe in Buddhism and Taoism but others are Christians. Hinduism is mostly practiced by the region's Indian population. Many indigenous people have converted to Christianity but others still practiced animism. The Malaysian Ringgit is equivalent to 100 cents (sen). In local trading, the currencies of neighbouring countries are often accepted, in particular, the Singapore dollar, the Thai baht and the American dollar. |The exchange rates from different world currencies are quoted by the national bank (Bank Negara) as well as by other private banks. Apart from the banks, many money changers are located throughout the city area (especially at Beach Street, the commercial hub) to trade in smaller denominations. Malaysia's road system is extensive and is among the finest in Asia. It covers a distance of 63,445 km. Excellent local and long distance bus, taxi cab and tourist coach services operate throughout the country. The total number of vehicles, registered at the end of 1990 was about 5.2 million. The interurban North-South Expressway, New Klang Valley Expressway (NKVE) and the Federal Highway Route 2 (FHR2) are the largest road transportation infrastructure in Peninsula Malaysia. The 848 km expressway links major industrial areas and urban centers in the country commencing from Bukit Kayu Hitam in the northern Kedah State to Johor Bahru in the state of Johor in the south. The East-West Highway serves as part of the Asian Highway System linking Thailand with Malaysia. The completed portion covers 115 km. The government is focussed on the further development of an efficient and integrated public transport system. Currently, buses, taxis, trains and airplanes represent the major modes of transportation, be it inter or intra city/towns. The number of buses have increased from 29,929 in 1993 to 41,912 in 1997 while the number of taxis, hire and drive cars increased from 44.040 in 1993 to 66,573 in 1997. To improve the quality, efficiency and reliability of the bus and taxi services, several measures have been taken, such as amalgamation of transport companies, route rationalisation, provision of supporting facilities such as terminals, depots, signages and route information system. Rail passenger traffic, namely the intercity passenger services, was 6.5 million in 1993. But this decreased to 5.4 million in 1997 due to the availability of other modes of faster transport services. The total number of air passengers however increased from 22.8 million in 1993 to 30.5 million in 1997, partly accounted for by domestic and regional expansion of services. To facilitate intercity transportation, the rail has also been developed as an alternative regional commuter system. This includes the KTM commuter for regional operations and LRT II for metropolitan operations.